Thrust by a powerful force from my dark, warm nest, I slide into the cold brilliance of a new world. It is bewildering, this raw and frightening experience, but she is close with her searching muzzle and welcoming nicker. Her voice is familiar and good. Although my limbs are yet weak, the power of life rises urgently within me, and I stagger to my feet. It is not long before I am able to search for her milk and I find it; the nourishment she offers is sweet and rich and I guzzle it with a single-minded ferocity, as if there can never be enough of it. I hear a voice that does not belong to my mother. While still living inside her, I heard it and I recognize it now, but the sound is louder and more shrill. I will soon become accustomed to hearing human laughter. For now, what matters is the creamy fluid that oozes down my throat and soothes the pangs that stab my belly. Soon the straw-filled bed into which I floundered grows too small, and I stumble after my mother to explore the world beyond this one – a world filled with bright light that hurts my eyes. But the discomfort is short-lived as my legs hasten to keep up with her. Again, I hear the shrill sound nearby and I stay close to my mother’s side. The human named Jess falls silent. I peer at the two figures standing on the other side of the fence that surrounds my mother and me. One tall, the other short. I press even closer to my mother, who is now nibbling at some fresh greenery along the fence line. She seems unconcerned about the humans, so I decide they must not be harmful. Then the shorter human with the high-pitched voice comes closer to me. “Your leg isn’t that crooked,” she announces, sounding annoyed, then trots off after the tall one. They walk on their hind legs, these strange creatures. It is not long before there are more visits from the same humans and other ones. They come near, even slipping into the shelter where I entered the world. I have sniffed their extended limbs and have listened cautiously to their voices. Most of all, though, I am interested in others of my own kind, who live in distant fenced-in areas, much like ours. I see mothers and foals. With each passing day, the small ones have grown stronger and more inquisitive. Many of them are trotting now, skittering around their enclosures, attempting to entice their mothers to play. I have done the same with mine and sometimes she slow-canters around the pen, with me trying vigorously to keep up. One day, two large humans corner me in the shelter. I am terrified and call frantically to my mother, who whinnies in return. But she is held captive by another human and cannot help me. I see something encircling her face. Before I can escape, there is a similar tight contraption around my muzzle and behind my ears. I half-rear. The humans back away and leave me scared and puzzled and shaking my head. “Lose that attitude, Patches,” one of them rasps at me. They leave me in the shelter, and I bound out to find my mother. As always, she is there with her soft nicker and gentle nudge. I reach beneath her belly and drink long gulps of sweet milk. In spite of the contraption around my face, I am comforted. Some days pass and the late spring sun beams on my world and strokes my back with warm caresses. Then one morning there is a surprise. The gates open and at last I am able to get to know the foals I have seen only from a distance. We squeal in delight to meet one another. Very quickly, they become my new friends. Meanwhile, our mothers graze placidly in a shared pasture. Sometimes I practise grazing beside her. Mostly, I am excited to play with the other foals. As more time passes, the sunlight becomes slanted, less intense, and mornings find the spears of grass stiff and cold against my muzzle. We are filled with rampant energy, my friends and I, galloping at each other and rearing, nipping and twisting through the air to show our skills. One of my front legs hurts a little and makes me feel off balance sometimes, but the fun of playtime is more important than a little nuisance. My very favourite buddy is a tall filly with wide shoulders, a curly straw-coloured tail, and muscles that ripple and gleam like sunshine on the water trough. She is mischievous, yet patient and kind all at once. I can run straight into her and she stands there like a massive tree, hardly moving, just looking at me with her long-lashed dark eyes. Then she bursts into action, luring me into chasing her. It works every time! I could live like this forever, playing with my friends (especially Sunshine Filly), and nuzzling up to my mother when craving her closeness and the milk she provides. But I learn that good things can very quickly come to an end. Although I stand compliantly now when the restraint is applied to my head, I expect it to be left on for awhile and then removed. This time is different. This time a strong human tries to lead me away from my mother. Suspecting that something is terribly wrong, I resist. She calls to me in a soft voice; I answer frantically and pull my head back in an effort to see her. The human snaps the rope down and makes an angry sound. I am trembling now. Soon I have been forced into a pen with many of my friends. We all mill about, wondering what is happening. Our mothers are anxiously trying to reach us. They call loudly, urgently, and this increases our agitation. Before too long, several humans approach us from behind and from each side. They act menacing, and we crowd toward the only route of escape, which involves stepping onto a slanted platform. My brave friend, Sunshine Filly, moves up the platform first. The rest of us follow, only to find ourselves in a dim, crowded enclosure. This does not seem right. We jostle one another, trying to find room or perhaps a way out. There is none. A loud bang startles us, and we are locked in. I whinny once again for my mother. I think I hear her, somewhere far away. It is the last time I will ever hear her voice. Suddenly there is a rumble and the world is moving. I struggle to keep my footing, but it would be difficult to fall, with the other foals pressing against me. I am desperate to be in the pasture, running with my friends and knowing that my mother is calmly watching nearby. For a very long time, we stay in this frightening enclosure. Hunger prickles at my belly and I am thirsty. I feel myself sagging against the warm, sweaty bodies around me. Then abruptly, just when I feel I cannot stand up any longer, the enclosure jerks and the rumbling stops. All is quiet except for the sounds of breathing around me. A spear of light pierces the enclosure as the door through which we entered swings open. Suddenly there are humans at the front of us, forcing us to turn around. These strange creatures appear to have somehow grown extensions on their limbs; we are terrified of them, and hasten toward the opening. Down the slanted platform we go on shaky legs, and we have escaped. But relief is short-lived. Although it is good to be outside, we find ourselves in a pen scarcely roomier than the moving one that brought us here. We sniff at the railings that keep us enclosed. Hoping to find food and water, we move about as much as the confined space will allow. There is not a stick of hay or a drop of water anywhere. Time passes, and the afternoon shadows grow long. I doze. Then an urgent human voice jerks me awake. “Where is the water and hay for these animals?” it demands. “Miss, I am going to ask you to leave,” is the answering drawl. We huddle nervously against one another. Eventually the angry voices subside and the humans move away. But the long day of frightening changes is not over yet. Suddenly several more humans appear. Gates clang open and a part of our group is forced into another enclosure. I whinny as some of my friends, including Sunshine Filly, disappear from view. But once more there is nothing to do but wait. Then the humans begin separating us once again. I am with a group of four being herded along to some new and terrifying location. One by one, we are separated from each other. I long to run after the colt in front of me, but a sharp crack to my shoulder stops me. I call out frantically. My turn comes. Frightened, isolated from my herd mates, I trot into a large area with bright lights and much noise. A dreadful babbling assails my ears and I shake with fear. “Meat horse!” a human shouts. Loud guffaws drown out the gentler voice. I am quickly driven out of that bright, noisy area and join five of my friends in a different enclosure. Relief floods over me as I exchange greetings with them. My very best buddy, Sunshine Filly, is not here, but maybe she will join us later. It is comforting to be with these others. We crowd into a corner of the small pen and keep a watchful eye out for more aggressive humans. Two approach our pen eventually, but their voices are soft and comforting. We almost scramble over one another to get to the flakes of hay that they toss over the railing. As my tummy fills, I hear a rumbling sound and glance up nervously to see a long, silver monster growling by our pen. It is sleek and angry and brings back memories of our trip here. I catch some familiar scents – my friends are inside. Sunshine Filly. And then I hear her voice calling to me. She is trapped in the belly of that monster as it lumbers away from us. I stop eating to answer her call, and once more she neighs. But her cries are soon lost in the wind and the dust as the monster becomes smaller and smaller, just a speck in the distance now. My ears perk forward and I listen and try to understand. Water trickles down the human’s face, and for a moment I stare into wet eyes that meet my own. Then my muzzle dips down to find more fragrant strands of hay. A human hand touches my shoulder. My skin responds with a quiver, but I do not pull away. Sunshine Filly has disappeared into the dust, but maybe we will find each other and I will have a chance to play in the pasture with her tomorrow. And my mother, with her soft nicker and soulful dark eyes, will surely be grazing nearby. Every year in Canada, tens of thousands of horses typically enter the slaughter pipeline to be killed for the money their flesh will provide. Most of that meat is exported to countries of Europe and Asia. Just this year, 2018, the Canadian government declared that it will no longer release to the public statistics of horses slaughtered annually, because there has been a consolidation in terms of the number of establishments slaughtering horses. We understand this “consolidation” to mean that one family business is operating out of two locations, one in Alberta and the other in Quebec. These are the two remaining federally inspected plants that slaughter horses for human consumption in Canada. The predatory pipeline that swallows the lives of countless horses, young and old, healthy and ailing, needs to be fed in order to meet industry and export demands. Without a steady supply of young horses and spent mares from back yard breeders and larger breeding facilities across the country, Canada would have far fewer horses to send to market. Irresponsible breeding practices contribute greatly to the numbers of horses sent every year to auction, where many are purchased by feedlot operators. Some horses are salvaged by private individuals and rescuers, but those are the fortunate few. In this story, “Sunshine Filly” was not one of them. She was sold for meat, and may have been killed in a Canadian equine slaughter plant or even live-shipped to Japan for slaughter. Caring Canadians can help by avoiding breeders who lean heavily on livestock auctions in order to offload their “culls”. Anyone wishing to give a horse a home is encouraged to adopt from qualified rescue facilities, where the resident animals are granted a second chance. For more information, please visit the Canadian Horse Defence Coalition. Citizens opposed to horse slaughter are encouraged to contact their Members of Parliament in order to voice their views about what can only be described as a dead-end industry. Stopping the indefensibly cruel practices associated with slaughter begins with compassionate people like you, who strive to help raise the bar concerning animal welfare and protection in our country. Our voices must be loud enough to convince Canada’s leaders that horse slaughter is an inhumane, unnecessary and antiquated industry that has now shrunk to fit the needs of a single family business enterprise in Canada. This industry is also notorious for attracting fraudsters, who have been known to enter erroneous information on the required Equine Information Document (EID) that must accompany every horse destined for slaughter. Thus, horses treated with prohibited drugs slip through the cracks and enter the human food chain. When our elected officials realize that their constituents are eager to vote compassionately, and that live horses are worth more to the Canadian economy than dead ones, a new paradigm can be reached. Horse slaughter will end because there is no need for it. Selective breeding will become the new norm simply because an easy way out – the option of slaughter – will no longer exist. Do this for horses: contact your MP about your opposition to equine slaughter. If possible, compose a letter to the editor of your local paper. This will help to educate others about the fate of so many beautiful horses in Canada every year. Add your signature to a government e- petition now circulating, regarding an end to the live exports of horses for slaughter. Mark Holland, a Liberal Member of Parliament is the sponsor of this petition. Please join the growing numbers of Canadians who will not sit idly by and allow our horses to be so cruelly treated by an industry that simply doesn’t care. Help grant all horses a brighter future, where feedlots, meat auctions, crowded transport conditions and the horrors of slaughter have been archived to become just a troubling chapter in Canadian history. It is time to place the horse slaughter industry behind us and strive to achieve our full potential as a nation that includes animals in its vision of peace and compassion. Also, forgot to mention …. I wrote a letter to the editor a few times, to the Winnipeg Free Press. I was expressing my concerns about Cavalia and my the use of animals in entertainment and horses slaughter in Canada. No surprise they have never published any of my letters or even part thereof … the Winnipeg Free Press I see is a sponsor of Cavalia AND raked in a good bit of revenue with advertising Cavalia. What does that say about unbiased media reporting in Canada, I wonder? This story was so sad and so true. Breaks my heart to know such suffering exists. 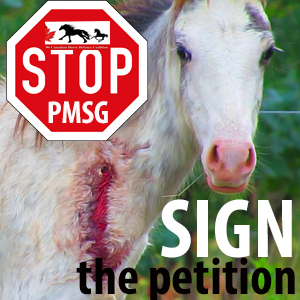 Many horse lovers are oblivious to it and each of us can do our part in raising awareness. Writing letters for sure. Donating to organizations like CHDC and/or legitimate horse rescues helps as well. I personally have taken it upon myself to inform horse lovers in Winnipeg who are attending Cavalia Odysseo about horse slaughter in Canada AND the fact that live horses are exported from Winnipeg to Japan for slaughter. Many are completely shocked. Some of them ask me about the horses at Cavalia. I guess there’s different degrees of abuse, depending on your point of view, but for the most part my issue is not with Cavalia. I’m just there because I know I will find hundreds of horse lovers… a golden opportunity to raise public awareness about horse slaughter in Canada. CHDC has been very helpful because I can print out leaflets ( with t permission of CHDC ) to hand out as well. Like I say, we all can make a difference.